Carrie Underwood's dark hit "Before He Cheats" won video of the year, female video and best video director Monday at the fan-voted CMT Music Awards, while teen newcomer Taylor Swift captured breakthrough video of the year honors. In Swift's hit song "Tim McGraw," the 17-year-old sings about two people who fall in love to a McGraw song, break up and are reminded of each other whenever they hear the tune. "I cannot believe this is happening right now," Swift said before she began thanking the fans, her family and a string of others. Sugarland won duo video of the year for "Want To." "Thank you to the fans," singer Jennifer Nettles said. "We love that you vote for that, it makes it that much more special." Comedian Jeff Foxworthy hosted the show, and Rascal Flatts performed their remake of Tom Cochrane's 1992 pop hit "Life Is a Highway." Foxworthy recapped the year in country music, including Dolly Parton's Kennedy Center Honor. "That's appropriate because if there's ever been a president who would enjoy Dolly Parton it's President Kennedy," he quipped. But he quickly became serious when he addressed the fatal shootings at Virginia Tech. "There are a lot of hurting people associated with Virginia Tech and we want those people to know in the days and weeks going forward that you are going to be in the hearts and minds of everyone in the country music community," Foxworthy said. "God bless you." The Dixie Chicks were nominated for video of the year - their first such nomination since country radio unofficially banned them. The trio was also nominated for group video of the year for their single "Not Ready to Make Nice." The Chicks have been at odds with country radio since lead singer Natalie Maines told a London audience in 2003 that they were ashamed President Bush was from their home state of Texas. But even without radio airplay, they managed to win three Grammys and sell 2 million copies of their latest album, "Taking the Long Way." "I understand the songs on that album are great, but I listen to country radio so I haven't heard them yet," Foxworthy cracked. Carrie started singing at an early age ! Carrie’s American Idol appearance last week definitely had a positive impact on the charts. Some Hearts saw a big jump in album sales and passes 5 million in total sales. And digital sales for BHC and Wasted also saw big increases. Wasted moved a step closer to being Carrie’s 4th #1 country single. Wasted debuted on 2 charts and reached new peaks on 5 other charts. BHC continues to climb on the CHR/Top 40 and Adult Top 40 airplay charts, as well as making big gains on many other charts. Carrie Underwood was born March 10, 1983. Her family already owned the farm in Checotah, Okla., though Underwood was born in the next town over, the one made famous in Merle Haggard's song, "Okie From Muskogee." Her father, Stephen, worked at a paper mill, and her mother, Carole, was an elementary school teacher. Underwood is the youngest of three sisters. Shanna is 13 years older and Stephanie is 10 years older. Underwood was just 4 years old when Shanna moved out on her own but says her siblings have always been there for her. Music didn't run in the family, but Underwood started singing at church when she was 3. Once she was in school, she sang solo roles in student plays. By the seventh grade, people were taking more notice of her voice as she entered local talent shows. She was told she had a "big voice" for "such a little girl." Her taste in music was varied, thanks to her parents (who liked oldies) and sisters (who favored '80s pop). She started listening to country music in the car. She was involved in her high school music program, but she kept telling people she was going to become a famous singer. Then she enrolled at Northeastern State University in Tahlequah, Okla., and became more serious about her career choice. She chose broadcast journalism for her major and produced a student-run television program and wrote for the school paper, The Northeastern. Music wasn't completely out of the picture. While in college, she had a role in a country music show where she learned about country legends like Patsy Cline and the Carter Family. She was still taking her college classes when friends encouraged her to audition for American Idol. At first, she resisted. However, she soon realized if she didn't audition, she would graduate, get a job and may never have a chance to try out for the show again. So one night after wrapping an appearance in the college country music show, she piled into the car with her mom, a friend and her mother and drove all night, arriving in St. Louis at 6 a.m. They had to be at the stadium by 8 a.m. to receive wristbands to be eligible for the auditions. Then she waited eight hours before singing Martina McBride's "Phones Are Ringing All Over Town" for American Idol supervising producer James Breen. Underwood didn't think she sang it well although she was invited to come back the next day and sing for executive producer Nigel Lythgoe. She sang another McBride song for Lythgoe, "Independence Day." On the next round, Underwood sang Bonnie Raitt's "I Can't Make You Love Me" for the show's judges, who sent her to Hollywood on her first-ever airline flight. As the weeks went by, the other contestants were voted off the show one by one, until the finale on May 25, 2005, when it was Underwood vs. Bo Bice. When Ryan Seacrest announced the winner, Underwood became America's new idol. She signed to 19 Recordings/Arista Records and released the single "Inside Your Heaven", which debuted as the best selling song in the nation with sales of 170,000. She broke Billboard chart history as the first country music artist ever to debut at No. 1 on the Hot 100. Underwood's "Inside Your Heaven" also became the first song from a country artist to go to No. 1 on the Hot 100 since Lonestar's "Amazed" did so in 2000. However, the single was scarcely played on country radio. Following her win, she performed on the American Idol tour and signed advertising deals for Hershey's chocolate and Skechers shoes. She released the single "Jesus, Take the Wheel" to country radio later that year; her debut album Some Hearts followed in November, less than six months following her Idol win. Some Hearts proved to be a huge hit, leading to the No. 1 hits "Jesus, Take the Wheel," "Don't Forget to Remember Me" and "Before He Cheats." She toured with Kenny Chesney as well as Brad Paisley in 2006. She also won her first CMA Awards in 2006, in the Horizon and female vocalist categories. 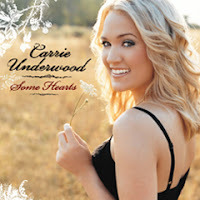 Are you a Carrie Underwood Fan?